An impromptu video reflection on the trial by Anabel Dwyer, Esq., expert on international law. 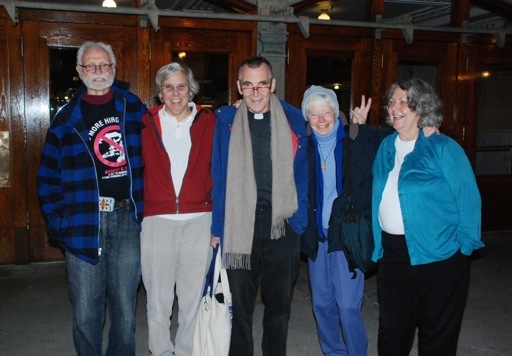 December 7, 2010, Tacoma, Washington: Plowshares activists were in court for the first day of their trial for entering a U.S. Navy nuclear weapons storage depot. The trial of the Disarm Now Plowshares five, who entered the U.S. Navy’s Strategic Weapons Facility (SWFPAC), Pacific on November 2, 2009 in a symbolic act intended to bring light to the immoral and illegal nuclear weapons stored and deployed from there, began in U.S. District Court today. During the morning’s jury selection there was an animated discussion. The U.S. Attorney asked if considerations of the defendants health and age, or the fact that they might be priest or nuns would hamper their ability to render an impartial judgment.